Concertina format In slip case. Remember London for ever with this exquisite cut-paper souvenir. 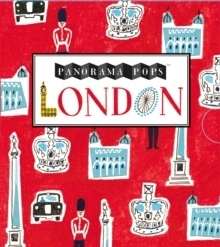 Presented in a beautiful slipcase, this stunning memento features twelve of London's most famous sites: Harrods, Buckingham Palace, Piccadilly Circus, Trafalgar Square, Westminster Abbey, The Houses of Parliament, The London Eye, St Paul's Cathedral, The Globe Theatre, The Tower of London, Tower Bridge and The Royal Observatory. Stylishly illustrated and folding out to a length of 150 cm, this is a perfect souvenir for anyone visiting the UK's capital city.